We all use audio editing and plugins on individual sounds and tracks to give them creative flair, but how many of us think to use such processes on the main output or for processing our final masters? Here are 12 tips that will help you create everything from extreme DJ style edits to subtle breakdown enhancers. For more on using master bus FX, check out the March issue of Computer Music (issue 188) which is on sale now. Load up a delay with a single wet/dry control and create cool edits by sweeping the control at the end of every eight bars. This works best with a fast delay time (16th-notes, for example) and, ideally, a ping-pong delay, which is less obtrusive. Try using a multiband sidechain plugin on your master output to create subtle low-frequency pumping. 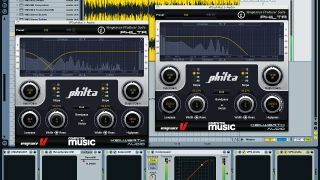 Vengeance Sound's Multiband Sidechain is designed for that very purpose, but a multiband compressor with a sidechain input (such as Waves C6 or iZotope Alloy) can do it - just apply the compression with a gentle threshold and ratio to everything below around 100-200Hz using a sidechain key signal from your kick drum. Precise reverse edits can be jarring because the timing is a little too precise - they can often sound better with the reversed material moved a touch early. Add your finished mix to a new project and create the reverse edits manually on another channel, and move them forward in time by 2-10ms, to let the end of the main track overlap the start of the reversed section by a tiny bit. People are increasingly used to hearing DJs use specifically DJ-orientated effects to enhance the breakdowns in the tracks they play, so why not use them in your own productions? Use DJ software effects in programs like NI's Traktor, manipulating them on the fly, then edit the results back into your master file. As a general rule of thumb, use a low-pass filter to smoothly transition into a breakdown, and a high-pass filter at the peak of the breakdown to maximise the impact of the track kicking back in. You can't beat the hands-on approach, so map all the main controls of your breakdown plugins - such as the delay and reverb wet/dry, and filter cutoff - to knobs and/or faders on your MIDI controller. The more extreme the effect, the quicker people will tire of it, so be careful: when adding doubles, delay sweeps, reverse sections and other edits, the temptation is to throw the kitchen sink at the track, then copy it to the end of every eight bars. Don't do it! Glitch edits often sound smoother when bounced and placed on a separate channel. Simply record the edit pass using your glitch plugin, then line up the edits underneath the original track, being careful not to create a volume jump between the two channels. It can sometimes be very effective to make a big, inclusive build-up but with just one sound (a fast synth sweep, for example) remaining unaffected. Create two tracks in a new project - one dry with your final mix on it and another with the sound that you're going to leave unprocessed. Alternatively, reroute everything going to your master out to an auxiliary channel, then send that and the 'dry' channel to your main output. Using a panning effect in your build-up can work wonders, and a great trick for getting away with extreme left-right panning without creating an off-balance mix is to use a bass mono-ising plug and set it so that the sound doesn't pan below a certain frequency. Making the mono cutoff frequency rise or fall as the speed of the panning increases is a great way to enhance the build. Doubling works best where there's a specific sound, vocal or effect that occurs at the start of an eight-bar section. Another interesting place to try them is on the snare hit that falls on the fourth beat of the first bar of eight. A good DJ-syle filter edit to try with either a high- or low-pass filter is to sweep the cutoff to remove the top or bottom end over the course of the last bar of eight, then sweep it back up from the first beat of the next bar to the second beat, so that the second beat hits at full frequency.